Believe it or not, this almost qualified as a recovery period during the workout we did today at Warrior Crossfit Muscatine. I carried an 80-pound sandbag 100 meters, which was a piece of cake compared to the three sets of 30 Burpees/box step ups I did in between the three sandbag farmer’s carries. You can tell it’s pretty early in the workout because my T-shirt is still relatively dry. The questions asked most often about my CrossFit experience are: Are you a glutton for punishment or something? Why do you push yourself so hard? There are many answers to those questions. And I don’t care to share all of them on Twitter, Facebook or this blog. Contrary to the teasing from some of my friends, the world doesn’t need to know — nor does it want to know — everything. But my No. 1 motivation for working so hard is no secret: I’m still a little upset with my dad. And while I consider comparisons with him to be high praise, the way he took care of himself is nothing anyone should emulate. 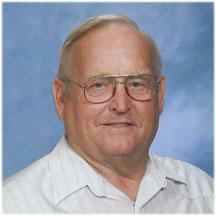 My dad, Tom Steinbach, died on Nov. 26, 2008. He was 69 and about two months short of his 70th birthday. He died three or four years after he had suffered a pretty big heart attack. Shortly after the heart attack, he underwent bypass surgery, from which he never recovered as fast as he thought he should. In addition to heart disease, he had diabetes, which he never managed as well as he should have. I’m pretty sure he cheated a lot when it came to what he ate. Even though my blood sugar, blood pressure and cholesterol are overall pretty good, as a 45-year-old guy who still weighs way too much, it’s easy to worry about the future given my family history. That’s one of the things that motivates me to push so hard at Warrior Crossfit Muscatine, to ride so many miles on a bike and eat better. Thinking about my dad is also why I liked the workout today even though it was damn hard. 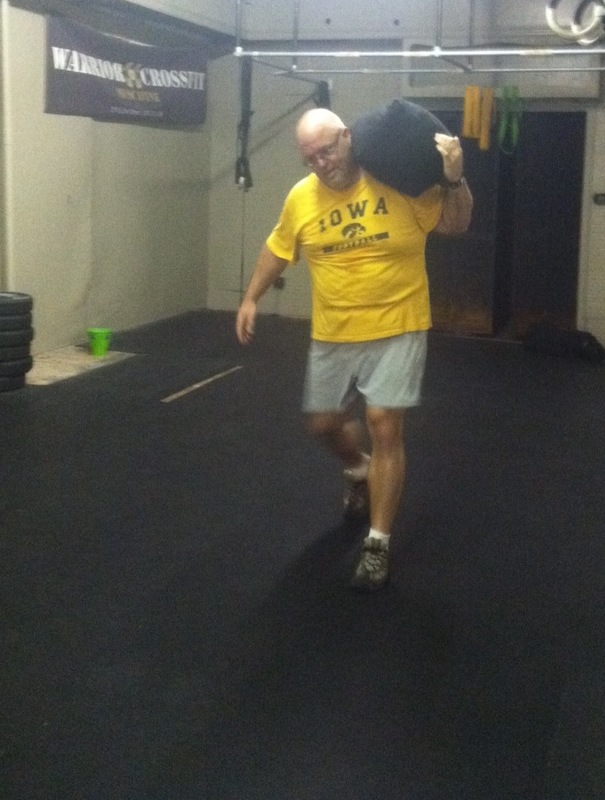 Farmer’s carries with an 80-pound sandbag — that’s something I’ve done before. Many times. When I was maybe 13 or 14, I spent a summer helping my dad and his dad pour the concrete for a very big basement. We mixed the concrete ourselves — about a yard or two at a time — in an old mixer mounted on the back of a Farmall H tractor. You had to pick up to shoulder height a 94-pound bag of cement, dump it in the mixer, shovel in enough gravel and mix with water. This became my job because I was taller and stronger than my grandpa, who would have been in his late 60s. And he got angry when I laughed at how he struggled to pick up the bags of cement. So he made me do it. I thought about that today as I carried that sandbag. In fact, I could hear Dad laughing at the idea of “city people” paying money to a gym in order to do such a thing. The Burpees combined with step ups or jump ups — all 90 of them — on to a 24-inch box were another story. Not fun at all. But I got through them because I’m determined to live longer than another 24 years. Heck, I plan on riding a bike longer than that. And even though he’s been gone for going on four years, I still wish someone could have convinced Dad to approach his health problems the same way. That’s all the motivation I will ever need. That YouTube video looks brutal. What happens if you just can’t keep doing them safely and with good form? Can you stop, or is that being a CrossFit Weenie? You modify them and do step ups instead of jump ups. I didn’t do any jump ups. White men can’t jumps. Especially 45-year-old, fat and bald white men. Good for you, Chris! Kind of scary to think about not living past 70.